Cliff zipped north to Vancouver, Canada, where he lives, and I set out the next morning for more of western Washington. A couple of friends had suggested driving through the San Juan Islands -- it sounded perfect -- but it would have taken time I didn't have. After crossing the bridge from the mainland, I came upon Deception Pass, so named because a couple of hundred years ago, a ship's mate (Joseph Whidbey) took the Island for the mainland. He thought the water they had entered was a bay. The ship's captain, a hardy soul named Vancouver (it's a popular name in these parts), named the island in honor of his first mate. Deception Pass is a pretty, wooded and rugged place. It offers several short, craggy, picturesque walking trails, and wonderful views of the waterways surrounding the island. One couple from Germany had walked down the stony cliff (there are steps) to the beach. Walking back up was another proposition. As I was headed down, they were headed up. I inferred they were German because I heard the man wheeze to his wife about halfway up: "Gott in Himmel!" And then something else I didn't understand. He had clearly hoisted many a foaming stein over his 60-plus years. The picture at left was taken from the top of Deception Pass, showing the water where many Washington weekenders speed around on Jet Skis and boats. The other photos show another deception, at least for our German tourists: it makes the 'hikes' look short and simple. Whidbey Island reminded me very much of Martha's Vineyard (a delightful island off the Massachusetts coast. Don't plan to visit: it's too crowded now). It was dotted with charming little curvy roads, byways and dead ends. The homes and lawns were modest for the most part, but neat and well-kept. The roads were in good shape (better than those on Martha's Vineyard), and there were several towns of nice size. I had intentions of stopping and talking to people I met along the way, but eventually wanted to wind up at the south end of the island. There, I could catch a ferry to the Olympic Peninsula. Or so I thought. Somehow, I got off the road that would take me directly south and to the ferry over to the Olympic Peninsula. Instead, I wandered down many a pretty winding road to nowhere. Finally, I found myself at one end of Whidbey where there were many, many beach cottages, jumbled up close together. I had lived in one of these kinds of houses on the east coast, I'm too familiar with them. I know that they are charming, offer great views, but are seldom insulated, have quirky plumbing, and frequent water and storm damage when the winds turn fierce. And there's always the problem with nosy neighbors, just scant inches away. Me: "Can you help me? I seem to be lost." Man: "Where do you want to go?" Me: "I believe there's a ferry..."
Man: "Ah, sure. You go down here (pointing) about, say, half a mile..."
Woman: "Jim, let me. You go about a MILE until you come to an intersection where there are purple flowers...I think they're hollyhocks..."
Man: "That isn't where the flowers are, and besides, they're beach spray and they might be gone." Woman: "JI-IM, let me. You look for the flowers and you turn left. Then you go slow, because the police are everywhere, for about five miles until you come to a horse corral on your right. Turn there." Woman: (looks at me as if I should be institutionalized) Well, of course turn right. Or...wait. Maybe you turn before the corral. Yes, you do...but maybe..."
Man: "Look for the sign for the ferry. It's very small. It's at the end of the road. You'll be at a 'T"." Me: "That same road, the five-miler?" Man & Woman, together: "Yep." They were short people, both buttoned up to their necks in hardy looking beige windbreakers (the wind that day was stiff, and chill), and sturdy corduroy trousers. The woman had a green scarf tied tightly around her head, the man a dark blue Navy watch cap pulled around his dome. Neither head covering disguised their wild sprays of iron-grey hair. They had clear blue eyes, both. Their skin was tanned, healthily wind-and-weatherworn. They strolled away, obviously out for a walk, hand in hand. Trying to find the route was an adventure in itself. There were no purple flowers, hollyhocks or beach spray. But there was a minuscule sign with an arrow: "To Ferry." On my way, I drove down a hilly, curvy road that had less well-cared for properties, and a generous share of trailers parked off in the fields. Some looked inhabited. Many looked abandoned. 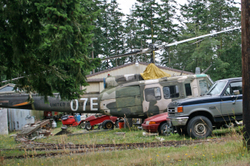 But the strangest sight of all was encountering a house with a junk-filled yard, in the middle of which was an old helicopter. Yep, a helicopter. I stopped to take the picture you see, since it seemed so incongruous, so out of place. And I wondered: how did it get here? Who brought it to this smallish island? Why? Why did they park it in their yard? Did they plan to live it it? What did it represent to someone's life? I didn't have the guts to walk up to the door and ask, so I snapped the picture, and snuck away, content to speculate. Now you can, too. On the right road at last, I came to an overpass, turned right as a "ferry" sign directed, and felt well satisfied that I would indeed be on the ferry within a few minutes to the part of Washington State that juts out into the Pacific. In a short while, I came across Camp Casey, once an army post, now a summer camp for teenagers and a conference center. Also, up the hill from the camp was a lovely, lonely- looking house, overlooking the water between Whidbey Island and the Olympic Peninsula. But mainly, I encountered a llloooonnnngggg line of cars, waiting for the ferry. I had completely neglected several pieces of information that I hope will be helpful to you, if you ever travel anywhere a ferry is involved. 1. If it is a Sunday, chances are people will be returning from a weekend vacation. Crowds should be anticipated. 2. Check out the size of the ferry, that is, how many vehicles can it take? 3. Is there more than one ferry boat? 4. How long is a one-way and round-trip? And so on. None of these considerations occurred to me. So I got into a line that was one mile and four hours long. Even at the ferry loading dock, there was delay after delay, while drivers argued over the price, the waiting time, the poor facilities, and on and on. I just wanted to get on the damn boat. Which I eventually did. It was a gloomy,windy day, and the sea was rough, even for the ferry. 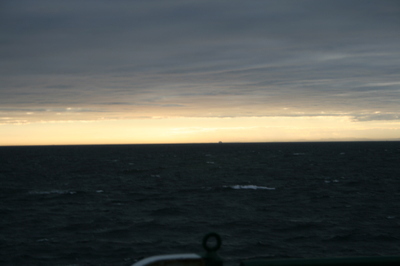 Still, off to the west, a beautiful sunset was trying to break through, and looking at it, I felt much calmer than I had just minutes earlier. The next stop was Port Townsend, which is the subject of my next posting. My favorite part of this story is your exchange with the Whidbyites. What a chuckle! Having grown up on Martha's Vineyard and now living on Whidbey Island I enjoyed your posting. Reminds me of Marshall Dodge's Down East stories of Bert & I. Can't figure out where you were when you met that couple, though. It's just lucky you got directed to the right ferry, since there are two to the island - each dropping you at a very different place in "America". An important aspect of Whidbey Island for me is that there is a bridge off the north end - something I promised myself had to exist before I'd ever live on another island after suffering years of nightmares about missing the Woods Hole/Martha's Vineyard ferry and then being stuck on that island. Oh boy!!!!!!! Another adventure! Love the photos! Glad to know your wanderings are continuing! I was starting to worry! Leaving Manhattan - now married to the military and having to be transplanted to Whidbey. Was hilarious to read about what is in store!